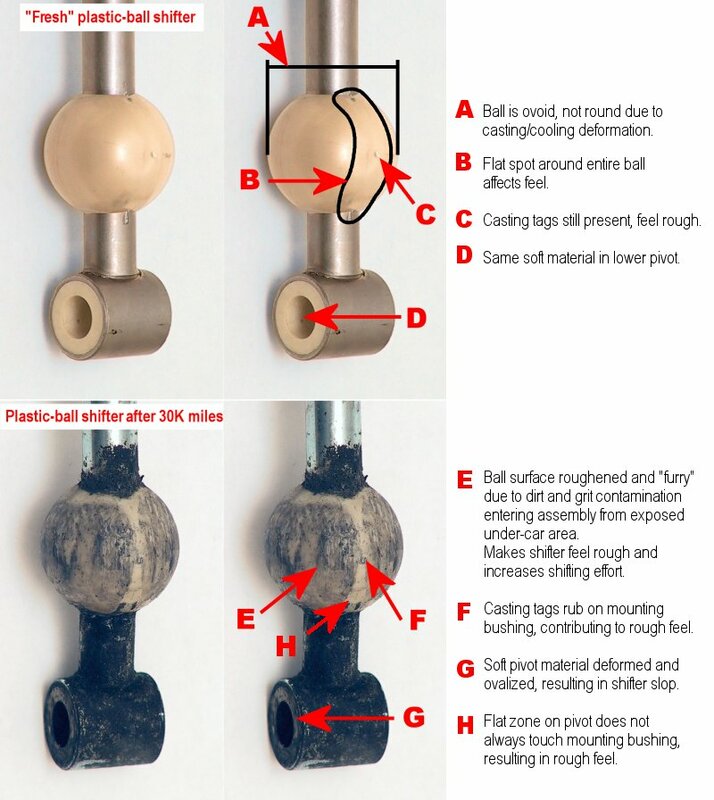 The truth about plastic shifter balls. 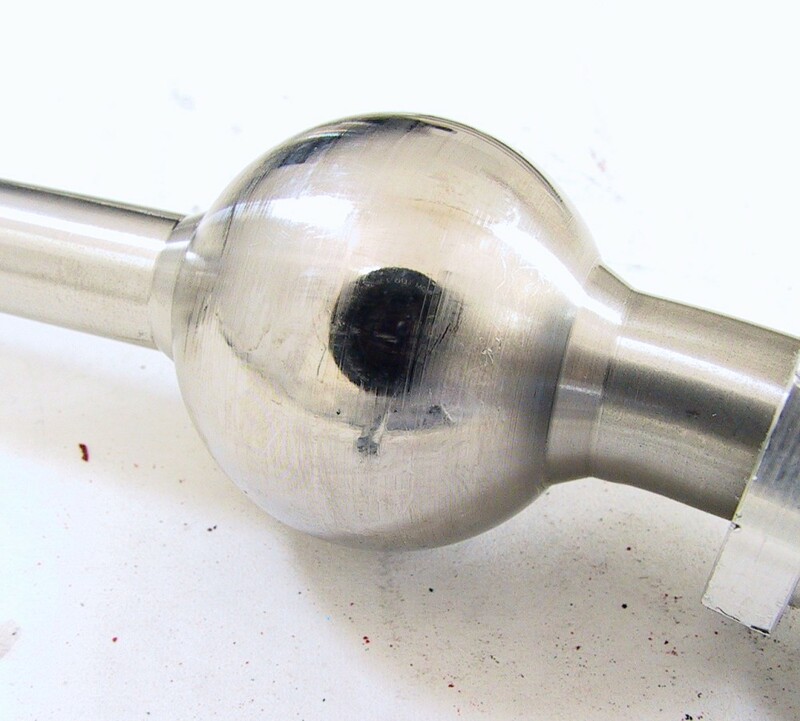 One of the important upgrades that UUC makes to the BMW shifter assembly is the change from a plastic shifter ball to an integrally-machined steel pivot ball. Steel ball is machined to exacting standards, perfectly spheroid. Plastic casting deforms as it cools, becoming ovoid or flat-edged. 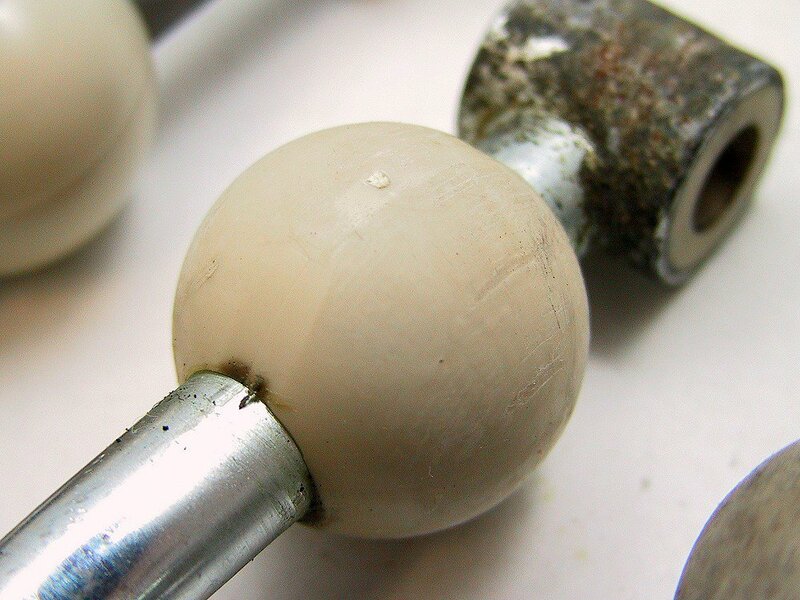 Casting marks will always include lines, ridges, flat areas, and injection-point pimples or dimples. As the pivot ball wears from normal use, steel becomes polished and even smoother. 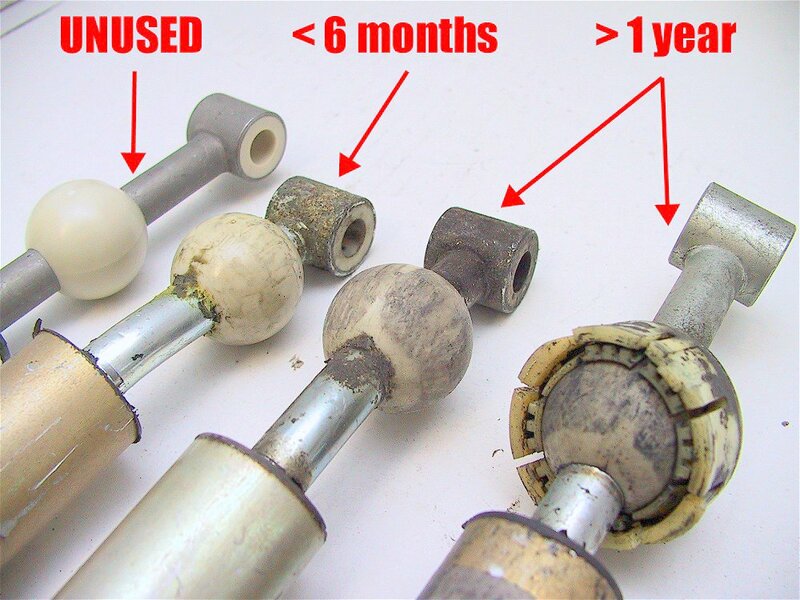 Plastic becomes rougher and is damaged by grit and other contaminants that enter the pivot bushing area. 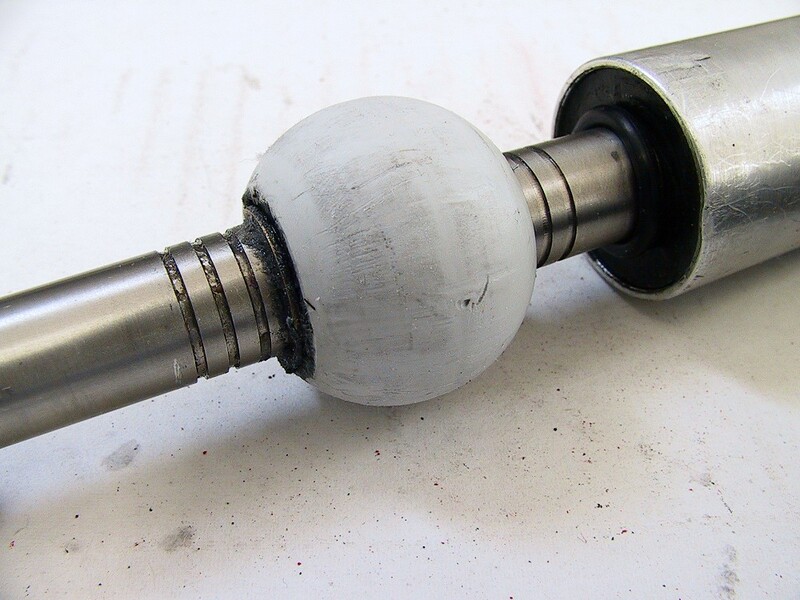 The integrally-machined steel ball can never become loose, rotate, or vibrate. 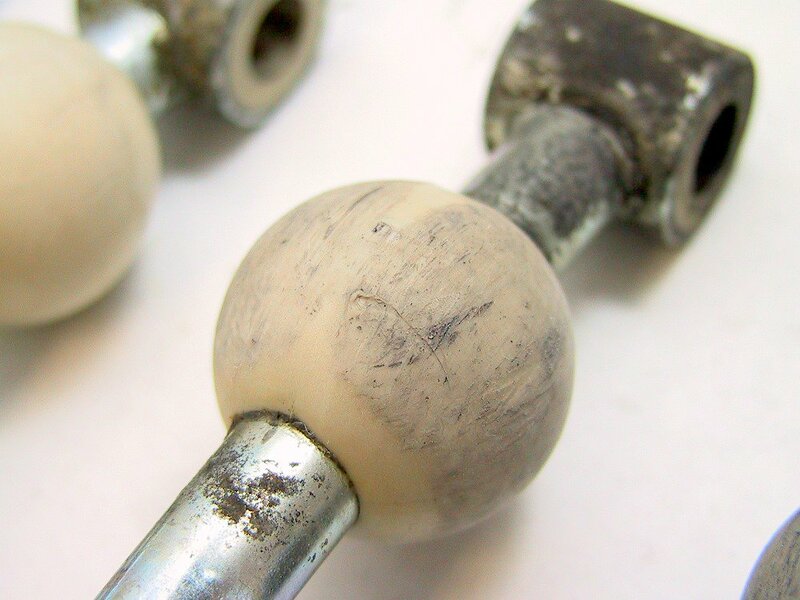 Plastic balls can become brittle with age and break, or get loose and wiggle. Why does BMW use plastic shifter balls? The answer is obvious: cost. 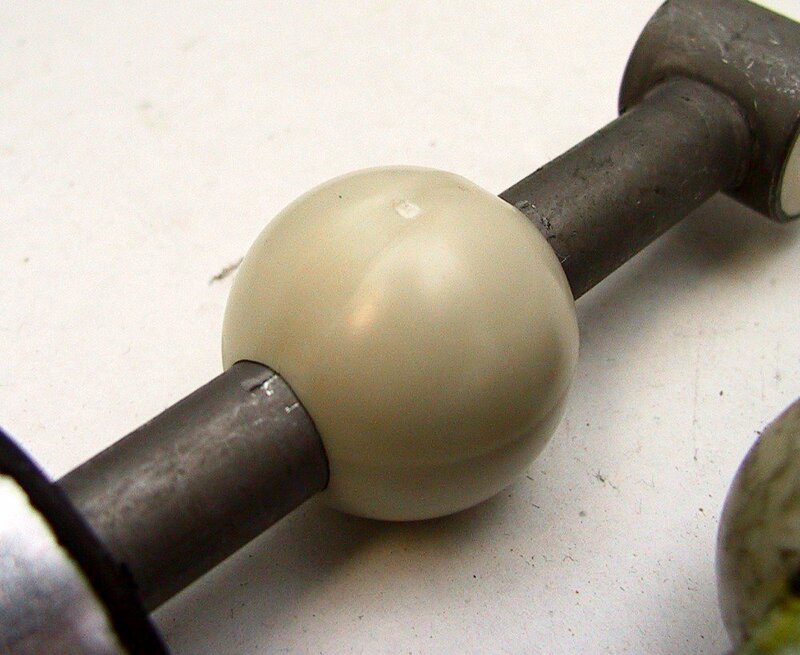 It's cheaper to make a solid rod and slip a plastic ball onto it than make an entire metal assembly. Actually, we know that the plastic ball shifter was not always used by BMW; they started appearing in various models around the early 1990s, along with a wave of other cost-cutting measures. 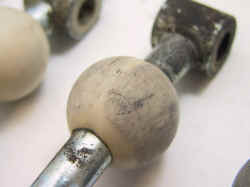 Previous to that, BMW used steel-ball shifters in all models. In fact, it was not until the less-expensive plastic-ball shifters appeared that we started to hear about BMW shifters failing, actually breaking under hard use. Dotted lines show seam on side, flat area all along other side, and casting flash. 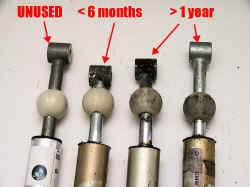 New shifter shown on left, used shifters as removed from BMWs of various ages. Shifter on far right is still wearing the nylon cup bushing. Note the eight "fingers" that grab the shifter, and the slots in between that let in grit and debris. The specific wear characteristics of this become obvious. All used shifters cleaned with de-greaser and wiped free of debris. 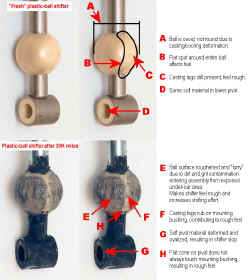 Note the year-old shifters with distinctive wear pattern from nylon cup bushing. After only 6 short months of driving, wear is already evident. At one year, roughness that is noticeable to the driver is present. Wear pattern exactly matches "fingers" of nylon cup bushing. WHAT ABOUT OTHER AFTERMARKET SHIFTERS? 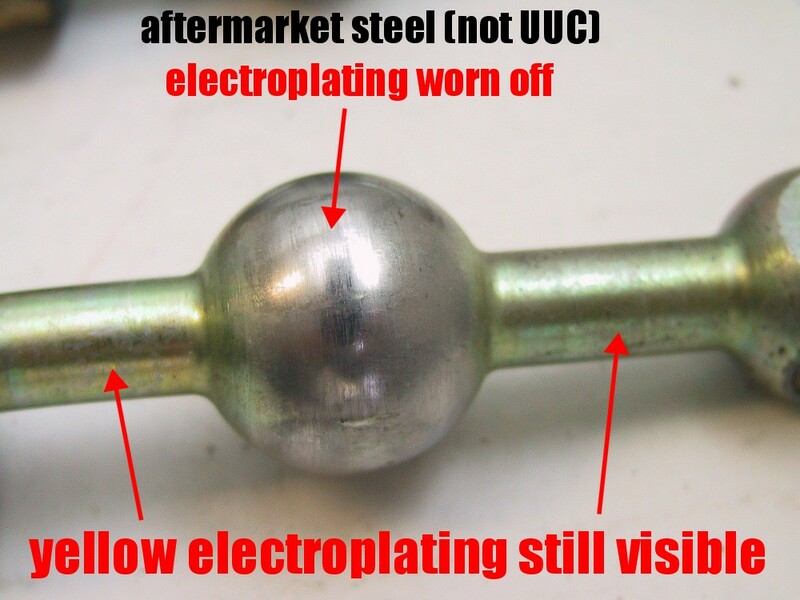 Non-UUC brand that uses a steel ball is a good example of the wear that occurs. 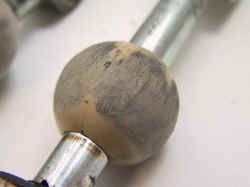 This shifter was electroplated in a gold color... note that this has worn off at the pivot ball. Wear simply happens in any component that moves in contact with another component, but how the material holds up is the key to longevity and continued smooth operation. Another plastic ball. Compare identical wear patterns to factory shifters. 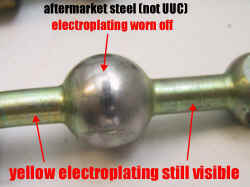 UUC integrally-machined steel ball after about 10K-15K miles. Note the mirror-polishing in the wear zone... look closely enough, you can read the brand name of the camera in the reflection.